What I Ate Wednesdays #6: Summer is here! Yes, summer is finally here. I am officially done with my Junior year of college as of last Thursday. I decided to take a whole week off to do nothing – therefore I came to my parents’ house in the suburbs for a few days. So then, finally, my WIAW looks a bit different than usual. And I think that’s a good thing – I needed variety in my life. My daily eats have been looking boring lately. Well, not like this time they are, like, super exciting or fancy or anything… but the whole day looks different from what I’ve been doing lately. Here’s what I ate on Monday. Before my morning weight training session, I had three dark chocolate covered blueberries with acai to give me some morning energy. I usually do my workouts in my building’s gym, but since I’m in the suburbs, the commute to the gym was a bit longer so I didn’t think going sans-snack was a good idea. 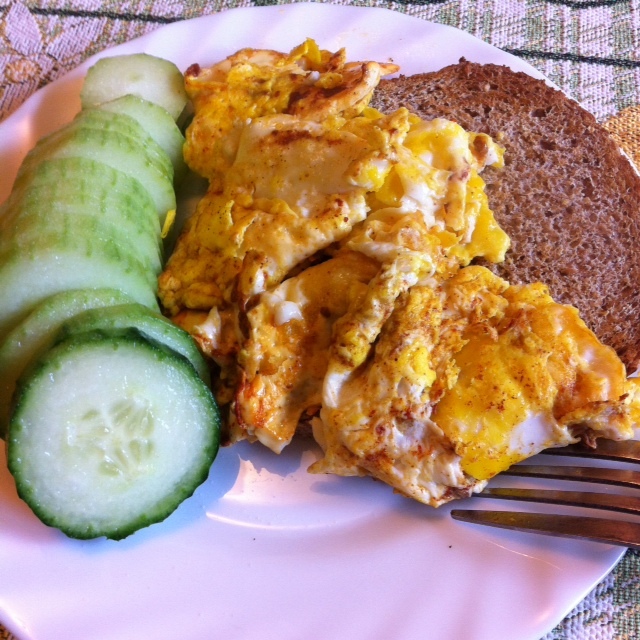 After my workout, I had two small organic scrambled eggs with ezekiel bread and cucumbers. Green tea on the side. 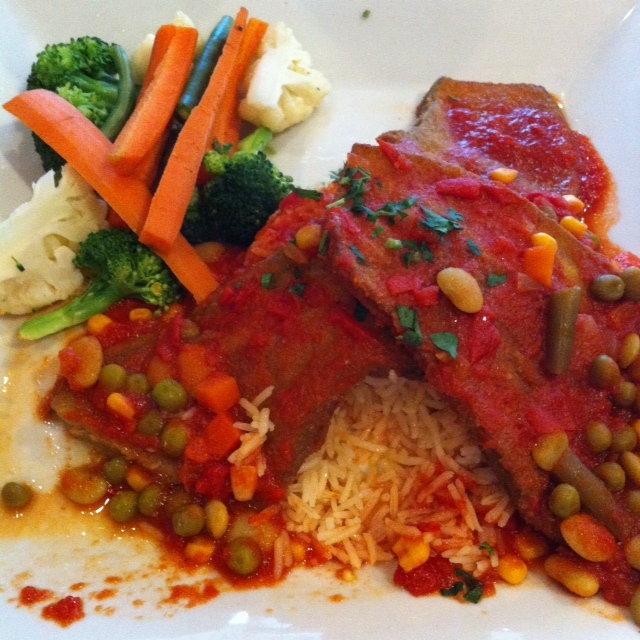 Then I had some leftovers from our dinner last night at a Mediterranean/Egyptian restaurant. Fried eggplant, rice, and veggies. It looked like this, but I managed to only eat about a third. Then I baked something awesome with the fresh strawberries we bought yesterday at Coscto. Unfortunately, a lot of them are already overripe. I hate when that happens. I took a slice of this loaf and topped it with more fresh strawberries and cottage cheese. 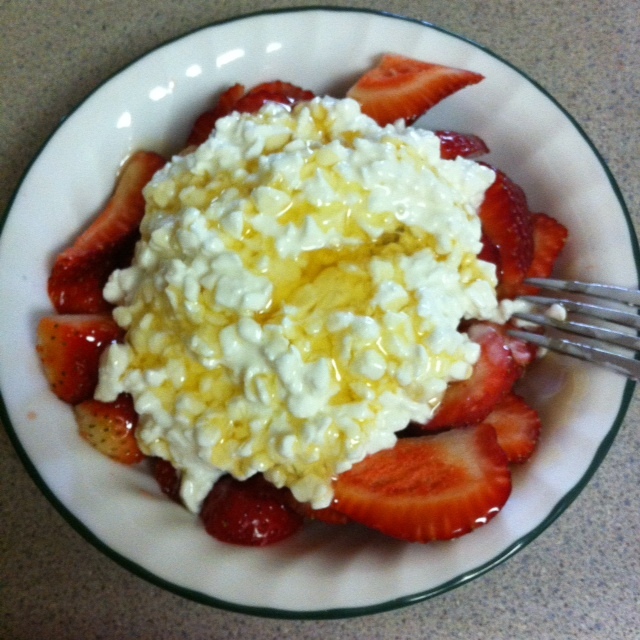 Drizzled some (okay, a lot) of honey on top. PS. Today is the LAST day to enter my giveaway for Fruition Superfood Snacks. Enter now! Congrats on being done junior year! Enjoy our spare time- looks like you have been, so much good looking food. Can’t wait to see more! Not boring at all! Everything looks great. 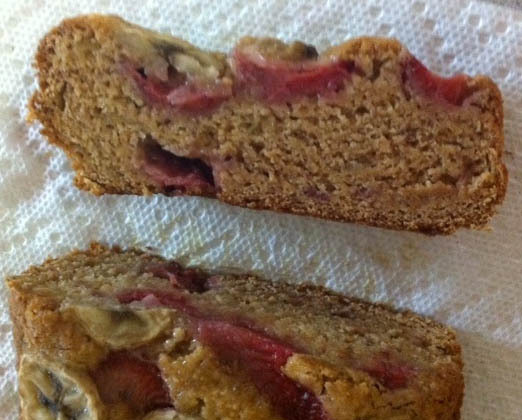 I’m really loving that strawberry, banana, and almond butter combo! Gotta try it. Yum! Everything looks wonderful!! Congrats on gradualtion junior college, thats awesome!! Yay for being done junior year! That must feel good. I love having a little bit of extra time … and when I do, I spend more time preparing my meals. So your eggs have me drooling, that’s usually my dish of choice on laid back mornings! I love eggs. And I’m definitely trying to enjoy my week off as much as I can. Back to reality next week – internship starts, although I’m pretty excited. Wahooo congrats on being done with junior year! That must feel pretty wonderful to say the very least 🙂 The cottage cheese dish on here is my favorite, I eat it almost everyday! I haven’t had cottage cheese in a while so I went a little crazy with it while I had the chance 😛 I have to buy some for my own apartment! & Thank you! I LOVE those chocolate covered blueberries! Do you get them at Costco? I love that you had strawberries multiple times during the day. I could eat them morning, noon and night! Yum! 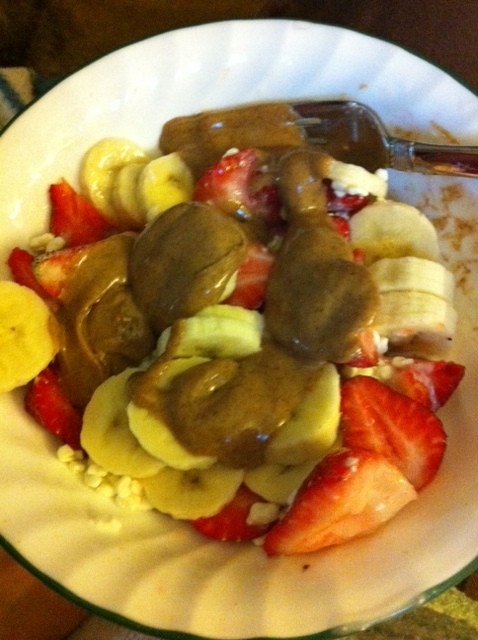 Strawberries, bananas and nut butter is the best combo!